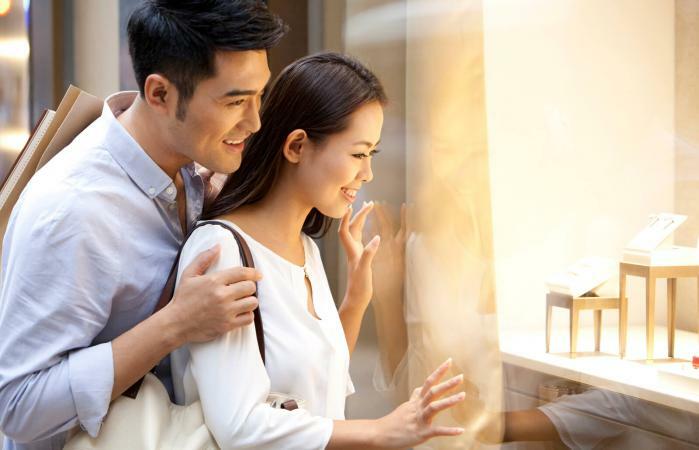 You've found the person you want to marry and planned a great proposal, but things can get a little trickier when it comes to shopping for an engagement ring. There are lots of guidelines available, but many come from jewelry stores and the diamond industry. The shopping process is less about plunking down two month's salary and more about choosing a ring you and your future fiance will love for the rest of your lives. Before you start shopping, you need to determine your engagement ring budget. While The Knot reports that the average spent on a ring in 2017 was $6,351, this is by no means a requirement. Instead, how much you should spend is a personal choice. Consider your finances, whether you and your fiance will need money for a down payment or other expenses, and the cost of your upcoming wedding. Set a figure you're comfortable with and stick to that. If your future fiance wears other rings, try to find out how well they fit the ring finger. Then you can swipe one to measure and compare to a printable size chart. Alternatively, play a game where you try different rings on together, using a pinky ring or other small ring that might fit perfectly. Look at your intended's other jewelry. Is it simple and modern? How about detailed and vintage-looking? This can offer clues about the perfect ring style. Talk casually about rings, especially when you see one in a magazine or on TV. Get a sense of what your future fiance might expect in terms of style and size. Talk to your intended's friends too. Ask about what he or she might like in a ring. Sometimes, it even makes sense to take a friend browsing at the jewelry store to help choose the best setting and stone. Unless you know there's a preference for a certain metal, choose something that will match other jewelry - especially things he or she wears all the time. There are lots of options, including yellow gold, white gold, rose gold, platinum, and even modern choices like titanium. When choosing a metal, keep your budget in mind. A platinum setting can use a lot of your ring-buying dollars and leave less to spend on the stone. Learn about the different styles of engagement ring settings to decide which one will be best. If the person who will be wearing it is practical and likes things uncomplicated, a contemporary setting might be best. Others will prefer vintage or antique styles. If you know your future fiance wants a diamond, take some time to read up on the four Cs: color, cut, clarity, and carat. These affect the cost of the diamond, as well as its size and appearance. If you think a non-diamond engagement ring might be a better option, learn about the properties that affect the practicality and cost of other gems such as sapphires, rubies, emeralds, and opals. Buying a ring online gives you the ultimate selection. You can choose from thousands of different designs and gems. It's easier to comparison shop online, which means you can make your ring-buying budget stretch a little farther. 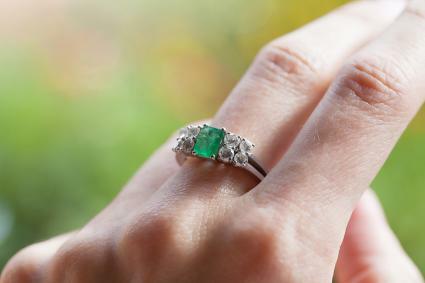 It can be unnerving to make such a big purchase without actually seeing the ring in person, so sometimes, it's better to go with a local jeweler. You can get the ring re-sized and cleaned at a local jeweler, as well as having it serviced yearly to ensure the prongs are tight and everything is in good shape. If you buy at a local jeweler, you're supporting local people and businesses. If you want a more exotic choice, such as an engraved band or an antique ring, you'll have better choices on the internet. Once you've purchased the perfect ring, your job isn't quite done. You should get it appraised and insured. That way, if something happens to it or it gets lost, you'll be covered. Shopping for an engagement ring can feel overwhelming, but if you break it down into smaller tasks, it's no different from any other big purchase. Take your time and do your research, and you'll end up with a ring that will sparkle on your beloved's finger for decades to come.